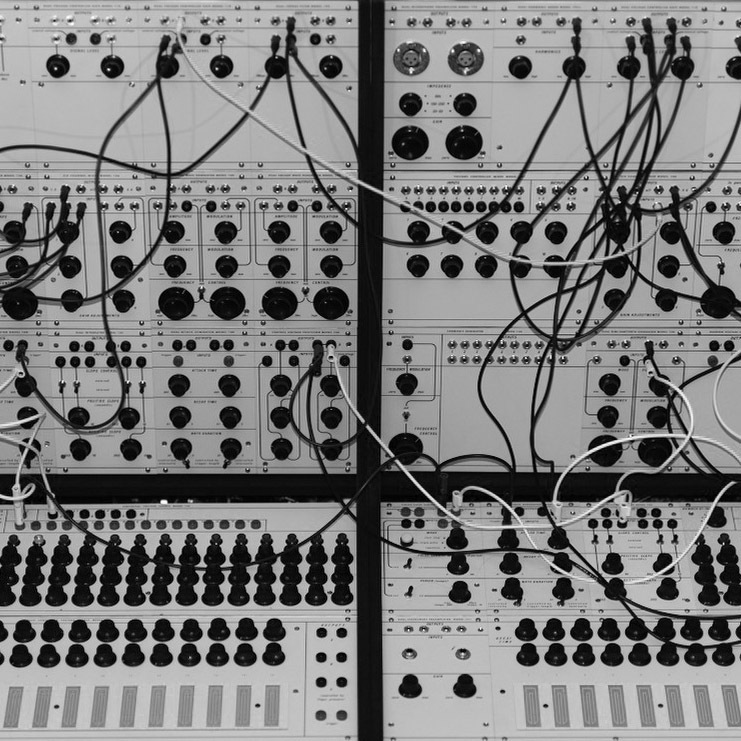 Welcome to the online resource for the Buchla 100 modular music system. Designed by Donald Buchla in the 60’s for the San Fransisco Tape Music Center to replace their ageing equipment which were described as ”…ingenious application of surplus equipment that saw service in World War II bombers…”. The basic objectives were to build something portable, flexible, cheap, and transistorised. The 100 system was later sold to the, now defunct, music division of CBS. This is however not a history not a history lesson regarding the Donald Buchla legacy — This site is a catalog of the modules made in the 100-series. If your aim is to know more about the STMC and electronic music in the 60’s and it’s better to find literature about the subject. The One Hundreds is a resource and personal endeavour. As such it’s not a commercial project and nothing will be made available to the general public. radio, microphone). In constructing a piece, they may be filtered, gated, mixed, modulated, or otherwise processed. The patch cords carrying audio signals within the system are grey, shielded cables terminated with miniature phone plugs. A standard level of Odb (ref.600Ω) isemployed for audio signals within the system. Control voltages, used to determine frequencies, envelope characteristics, amplitudes and other parameters, are generated by keyboards, programmable voltage sources, and format generators. Black banana plug patch cords are used to interconnect control voltages. The standard control voltage range is from .5 to 15 volts. Timing pulses are originated by keyboards, programmable sequencers, and pulse generators. They are used to trigger notes, open gates, or initiate chains of musical events. Timing pulses are about 10 volts in amplitude and are interconnected with red banana plug patch cords. The rules for interconnection are straight-forward. Any number of inputs may be connected to a single output. Timing pulse outputs may be paralleled and con- nected to one input. The system output may be derived from any module; output is of sufficient magnitude to drive line inputs on tape recorders or sensitive inputs on power amplifiers. Power is +15V for all modules with an additional +24V for some. All known modules are presented with text from the 1968 catalog. Price from the same catalog with the price in brackets are adjusted for inflation (2018). Images of some modules are missing: 117 because it’s unknown what it looked like (The 157 was listed before, but I have received a picture of it since, so now I just have to build it). 150, 172 and 176 because of lack of schematics. 185 is built with 2 x 196, 1 x 110, and a 106 — All stock, except the 106, which is modified to get the inverting function for the down shift. What this modifications looks like is unknown. The 113 and 120 seems to be left out of the catalog, perhaps because only one set were built for David Tudor, a guesstimation would be that it’s two 114 and two 107 in a different outfit. The 132 is also missing, only one was ever built. If you have any information regarding any of the previously mentioned modules — please let me know. All modules represented here are copies of the originals, built from the original schematics. Specially designed walnut cabinet accommodates power supply and 15 panel units . (Most modules are 44″ x 7” and occupy one panel unit, but some are 82″ or 17″ wide and occupy two or four panel units .) Overall dimensions are 23″ x 23″ x 8″ . Two 5-channel mixers with both separate and common outputs . Input levels are controlled by externally applied control voltages usually derived from a Model 114 touch controlled voltage source. Touch activated keys produce one of twelve preselected voltages at each of two outputs. A third output voltage is proportional to finger pressure, and a fourth output is a pulse generated whenever a key is activated. Generally used to initiate notes and control their pitches. Ten independent, touch activated keys, each with a corresponding control voltage output and pulse output. The voltage outputs are particularly useful for controlling gates (110 or mixers 107), and the pulse outputs for initiating attack waveforms 180) or other events. Regulated supply for powering a cabinetful of modules plus one or two keyboards. Installed in Model 100 cabinet, unit occupies no panel space. Two capacitance-actuated control voltage sources for enabling spatial control of sound parameters. Theremin-style antennas may be remotely located. 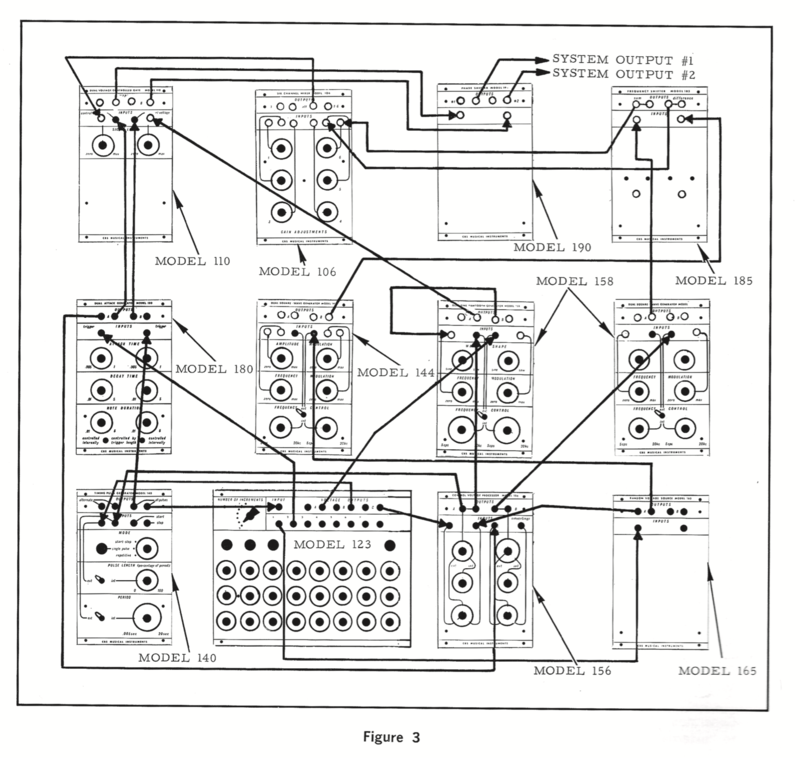 (Note: Schematic marked with ”Ask Buchla about this circuit, what is it used for”). Two independent oscillators in one unit . Frequencies are continuously variable from 5 cps to 20 kc and may be controlled internally or with externally applied voltages. There is provision for wide band amplitude and frequency modulation. from 5 cps to 5 kc and may be controlled internally or with an externally applied voltage. There is provision for wideband frequency modulation. The 148 is frequently used in conjunction with mixers (106, 107), gates (110), and attack generators (180) to enable precise programmed envelope control of individual overtones . Four digit counter measures frequencies to 100 kc with a preci- sion of 10 cps. Frequencies below 10 kc are measured with a precision of 1 cps. Produces continuous control voltage functions when used in conjunction with sources of discrete control voltages (e .g . key- boards, sequencers). Positive and negative slopes may be individually and continuously varied from 15 volts in .0025 seconds to 15 volts in 10 seconds; either or both slopes may be voltage controlled. Particularly useful for generating complex voltage controlled envelopes, frequency glides, and repetitive control functions. source. Particularly useful for obtaining fine pitch control, transposition capability, and range compression of control voltage sources. Four channel unit complements control voltages to accomplish a variety of inverted functions. Produces two uncorrelated, random output voltages, each of which is changed by applying a trigger pulse . Used to randomize frequency, amplitude, and time. Two high-gain mike preamplifiers. Input connectors are 3 pin XLR. Input impedences are selected by a panel mounted switch. Two preamplifiers for electric guitars, contact microphones, and other low-level signal sources. Input impedences are 200 kΩ; input connectors are standard phone. Two high-gain, constant-output amplifiers . Output signal levels are maintained at 0 db (± 1 db) for input variations of from -40 db to +10 db. Time constants are variable from .05 to 5 seconds. Used in studio installations to drive 600Ω headsets or unbalanced lines at a nominal +4 db (max. +20 db). Unit incorporates bass and treble controls of the variable turnover variety. Reduces tape hiss by restricting bandwidth of signals that would otherwise be masked by high frequency noise. Signals above a certain threshold (including fast transients) are unaffected. Two independent spring type reverberators. Degree of reverberation is continuously variable. Divides an input signal into four frequency bands. Cross-over frequencies are 200 cps, 900 cps, and 4 kc. Slopes have sharp knees and are 12 db/octave . Shifts phase of input signal such that a 90° (±5°) phase relation- ship between the two outputs is maintained from 5 cps to 20 kc. Used in conjunction with ring modulators for frequency shifting or for exotic visual displays . I’ve designed and built two modules to fit the 100-series. They’re both built using only resistors, capacitors, and transistors in the spirit of the older modules. Two control voltage inputs are compared against each other. If respective input value is larger than the other, the corresponding pulse output jack will be high. A discrete wave folder, input a sine and outcomes a single rich in overtones. Thanks to Adam, Daniel, Mike, Mark and the other people who’ve helped out along the way.